The Ultra V Series and VS Series solids-handling, self-priming centrifugal trash pumps offer up to three times the pressure and up to 60% more flow. Available in a variety of pump station configurations or stand-alone in 3”, 4” and 6” sizes. 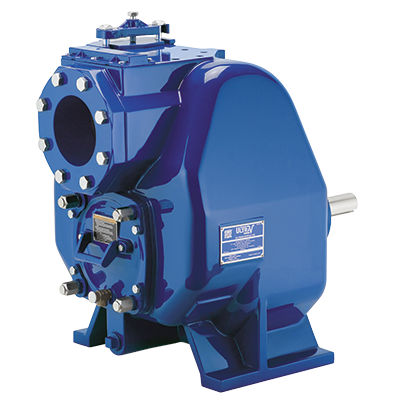 The superior solids-handling and increased pressure capabilities of the Ultra V Series pumps make them ideally suited for a variety of industrial and sewage applications. The "VS" version of these pumps can be used when system requirements exceed the Ultra V Series exceptional performance range. By mounting our UltraMate unit directly to the Ultra V through an innovative transition chamber, maximum pressure is increased up to three times the traditional solids-handling self-priming single stage pumps. Losses associated with conventional series connected pumps are also reduced, resulting in increased efficiencies. The UltraMate unit allows for a variety of discharge positions. This "smart scroll" feature offers installation flexibility. This vertically staged assembly also reduces the footprint required with conventional staging configurations. The rotating assembly and the back cover plate are interchangeable between the Ultra V and the UltraMate, reducing spare parts inventory.